Usher syndrome is a hereditary disorder that affects 1 in 20,000 people worldwide and causes concurrent hearing and vision loss. Though currently there is no cure, scientists have begun to understand the molecular mechanisms of hearing loss in Usher syndrome by identifying the specific mutations in genes associated with auditory hair cell malfunction. Gene-specific targeting has been used to target Usher mutations and restore hearing, but the effectiveness and best timing of the treatment is still being investigated in mouse models. Recent research published in JARO by Emerging Research Grants (ERG) recipient Michelle Hastings, Ph.D., and colleagues shows that early administration of a genetic targeting treatment is critically important for repairing outer hair cells and thus rescuing hearing in those with genetic disorders like Usher syndrome. Hastings’ research focuses on type 1 Usher, which is the most severe of three subtypes and is associated with six genes. One of these genes, USH1C, contains the instructions to create a protein that localizes to auditory hair cells and helps to maintain their bundle structure and ability to detect sound waves. A mutation in USH1C causes this protein to be cut short and malfunction, and is thus responsible for type 1C Usher in humans. Adding, or “knocking-in,” the mutation to mouse DNA causes symptoms similar to those of human patients with type 1C Usher. These Usher mice exhibit hearing and vision loss as well as deficits in balance, little or no auditory-evoked brainstem response (ABR), and abnormal eye tests called electroretinograms. The hearing loss is linked to defective or missing inner and outer hair cells in the cochlea of the inner ear. Antisense oligonucleotide (ASO) therapy is a gene-specific targeting therapy previously used by Hastings and her colleagues to rescue hearing in Usher knock-in mice. ASOs are small strands of nucleotides (the building blocks of DNA and RNA) that are specifically synthesized to bind to the disease-causing mutation site of RNA and block it from creating defective RNA and proteins. 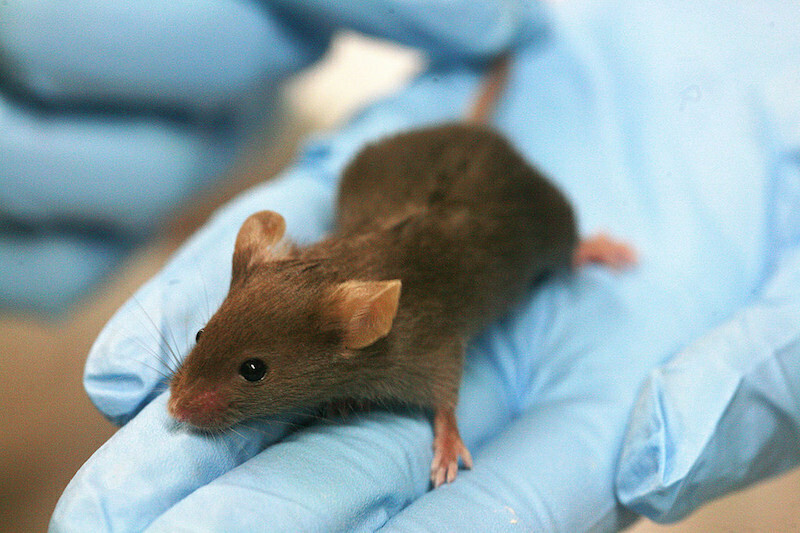 The ASO therapy targeting the USH1C mutation was administered to the Usher mice a few days after birth. Hearing was rescued and ABR improved, which is indicative of improved inner hair cell function. However, function of the outer hair cells, which surround the inner hair cells and are responsible for amplifying sounds, was not tested. Hastings’ most recent study, with Jennifer Lentz, Ph.D.’s research group, investigated whether the timing of ASO treatment is important for rescuing outer hair cells in addition to inner hair cells for full hearing rescue. ASO therapy was administered to knock-in Usher mice of varying ages, and then outer hair cell function was tested by measuring distortion product otoacoustic emissions (DPOAEs) in 1-, 3-, and 6-month-old mice. When two tones are presented in the ear canal, outer hair cells that function normally respond by producing amplified sounds known as DPOAEs. In Usher mice, DPOAEs are not detected, which indicates loss of outer hair cell function. ASO treatment was able to recover outer hair cell function measured by DPOAEs when it was administered one day after birth. However, the treatment was not effective if first administered on or after postnatal day five. The results of this study indicate that there is a developmental window of time when USH1 gene expression is needed to properly develop auditory hair cells, and thus early genetic treatment is essential for hearing rescue of those with Usher syndrome. In humans, hair cell development occurs early in pregnancy, and thus ASO treatment would likely require very early prenatal intervention. ASOs have been approved for clinical use for a number of different diseases in humans, but more animal research is necessary before moving to clinical trials for ASO therapy for Usher syndrome. Hastings has also published research on testing ASO therapy on prenatal mice, and found that injecting ASOs in the amniotic cavity of pregnant mice can in fact access the cochlea. Hastings’ research has improved the scientific community’s understanding of the functions of inner and outer hair cells and brings us closer to developing a cure for Usher syndrome. Michelle Hastings, Ph.D., was a 2009 and 2011 Emerging Research Grants scientist. For more, see “Rescue of Outer Hair Cells With Antisense Oligonucleotides in Usher Mice Is Dependent on Age of Treatment” in The Journal of the Association for Research in Otolaryngology.